Facebook is making waves in the online business world with it's April 26, 2016 update to it's branded content policy. any post — including text, photos, videos, Instant Articles, links, 360 videos, and Live videos — that features a third party product, brand, or sponsor. It is typically posted by media companies, celebrities, or other influencers. and branded content on pages as: content originating from the Page owner that features third party products, brands, or sponsors that are different from the Page owner. As it stands currently (April 28th) the policy language states that branded content on pages is “only allowed from Verified Pages (with the blue badge)” and that they must also follow very specific guidelines. ONLY pages that are verified (with the blue badge) are allowed to post anything for anyone else (whether or not you've been paid to do so). If you are a verified (with the blue badge) page, you may ONLY post branded (sponsored) content when it meets the Facebook requirements. If you are a verified (with the blue badge) page, and you do post branded content, and tag the owner appropriately, the owner will be notified of your post, have access to all the stats of your post, have the ability to share your post to their page, and pay to boost your post. They will not be able to edit or delete your post. 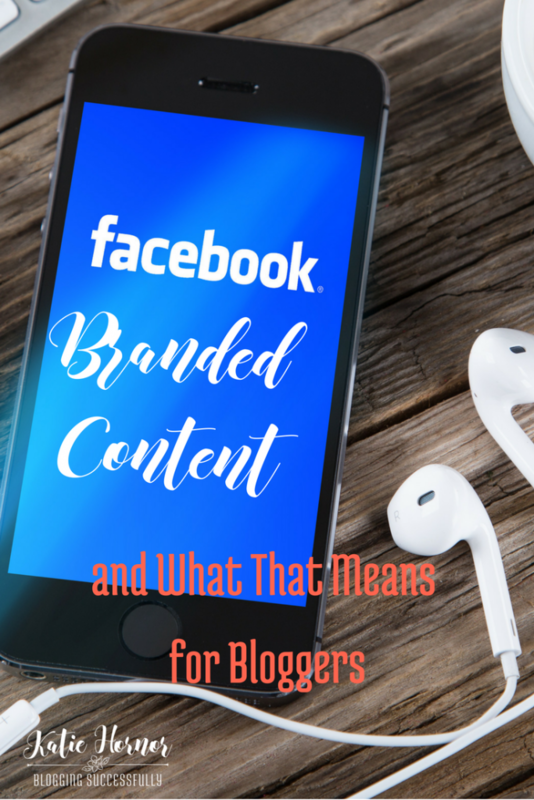 What does this mean for bloggers and business owners who use Facebook to spread the word? If your page is not verified (with the blue badge) you MAY post links to your website, your own self-created products, or images of your own branded logo/products. But you MAY NOT post any info about, links to or pictures of anyone else's posts, logos or products. That means, no affiliate links, or ad images at all on your Page. To get around this, you will have to 1. share (using the share button) someone's else's post to your page, or 2. link to an article on your website where the promotion of that brand or product can be found. However, if you have Facebook Instant Articles installed, the second option could also be problematic as Facebook also has strict rules about what may and may not be in your post when it feeds to Facebook Instant Articles. More about Instant Articles here. If you are a verified (with the blue badge) you, and anyone who posts to Facebook for you, need to become very familiar with the Facebook requirements for approved branded content. Read them in full here. Part of complying with the new regulation is tagging the brand you are promoting using the new “buddy” tool. You can only tag one brand per branded content post. Be very sure that you can provide what you promise in Facebook promotion because the brand will have a way to see all you are doing whether you like it or not. What they don't say (yet) is that this also sets up Facebook to be able to charge the owner of the 3rd party content because you promoted them. Q: Does this really apply to me? A: If you own a facebook page, yes, it applies to you. Q: How do I verify my page on Facebook? A. If your page is not yet verified on Facebook, and you'd like it to be, this post outlines how to request verification. or you can download the free printable checklist at the end of the post. We’re (Facebook) only accepting verification requests from Pages that represent celebrities, public figures, sports teams, media and entertainment. Our Pages Team is extremely backed up with Brand Requests at the moment and need some time to catch up, that is why we are unable to accept them at the moment. Q: How do I post branded content on Facebook? If you're not blue verified, you're not allowed to promote anything that is not your own content, per their current wording, and you also will not see the “buddy” icon. Unverified pages MAY still purchase ads from Facebook. Q: (updated 4/29) What if I am grey verified? What is the difference? A: Per another Facebook Rep: blue is for a public figure and grey is for a business. You can't get a blue unless you are a public figure. You need blue verification to post sponsored content. Grey just rolled out to separate the two. Pages with the grey check do not have access to the Branded Content button and features. Q: If I want to share a friend's post (no money or affiliate links involved, I just love her stuff or found it encouraging), can I? A: Technically, if you enjoyed an inspirational piece that you read and wanted to share it with your follwers by posting the URL and a comment on your blog page, you would need to disclose and tag the source of that article and it is 3rd party because it's not content owned by you. Using the share button to share her content from her page to yours is acceptable. (updated 4/29/16 to add) However, if you've applied for verification one Rep has said that you may “share branded content on a non-verified page” while you await verification. (I assume this means share by using the share button). What concerns me then is that Facebook has the potential power then go to that blog owner and say “Katie promoted your post and x0,000 people saw it, so you owe us $x00.00 for advertising on our platform.” Even though the 3rd party did not ask for, or pay you to promote them. Q: What is Facebook's reasoning behind this? A: Well, they haven't included me in the board meetings or strategy meetings, and I'm not very good at mind reading, but if I had to speculate…. (updated 4/30) Posting content that you do not own to your facebook account (including to profile, page, event and/or groups) is a violation of the Terms of Service (TOS) you agreed to when you opened your account. (See TOS here). Facebook has not been enforcing this policy, but appears to have decided to do so from here on out. It appears that Facebook is tired of not being able to control the small bloggers and small companies whose posts are becoming more ad-ish, and they also don't like to not be compensated for the promotions those bloggers do using their platform. It also appears that this was their intention all along. Ads may be used to promote content not your own, but posts of content you don't own are not allowed. By prohibiting unverified pages to post branded content and/or prohibiting your page from getting verified, Facebook is denying you permission to post any ads at all, clearing out A LOT of ads that were previously being shown to Facebook's audience. Now, Facebook may only allow pages to be verifyied (and I am speculating here) if the page works with larger BIG companies who have more Facebook friendly advertising budgets or who already have advertising accounts with Facebook making it easier to charge the brand when someone promotes the brand. In my opinion, this is Facebook's way of broadcasting the message that if it's anything but purely social chit chat, someone is going to pay for it to be shown on their platform. Another blogger mentioned that she tried to verify her page today, submitted documents of proof of business, etc, and was denied without explanation and simply told to “reapply for verification in 30 days”… I believe this supports the above speculation that Facebook only wants to play with companies with big bucks to advertise on their platform. If Facebook can track that your promotion of a brand gets x0,000 reach, they can charge the brand for the exposure the brand initially paid you to give. Smaller affiliate companies will not be able to do this/pay this, or just won't pay for it, and so by not allowing you to be verified and therefore not allowing you to post sponsored content at all, Facebook controls more of whose ads are showing. Q: Will my Facebook post get seen at all if I don't verify my page? A: I can't say for sure, but it doesn't appear that Facebook plans to show anyone's posts at all, unless you pay. I get the feeling that if you're self promoting only, they may leave you alone, and you'll just be left to organic luck. But if you want to be seen or if you want to continue to promote others – someone's going to pay for that and this is Facebook's way of enforcing it. There is no current information on what will happen if an unverified page continues to promote 3rd party content. You can assume if you're not compliant and the review team finally reaches your page, they are capable of just turn off views for your page altogether. I can't imagine they will have the manpower to monitor individual posts from thousands of bloggers daily, but it would be very easy to simply shut you down for non compliance to their stated policy. Q: Does this affect my personal profile, my groups or my events? A: (Update 4/30/16)The Branded Content Policy does not mention personal profiles, groups or events. However, the policy for your account states that you agree not to post content you do not own to your Facebook account, which would then include Facebook groups, events, pages and profile. Facebook is it's own business, and makes it's decisions based on what is good for Facebook. You own your business and must make decisions based on what it good for your business. You have a choice to make: play by the rules, or choose not to play. What are your thoughts on this? Do you welcome the update in policy? Why? or Why not? What other strategies do you have in mind to make up for it? Are Facebook's Terms of Service Misleading? So frustrating that FB does not seem to differentiate between sponsored content and curated content. It is. One bright spot though is that (at least for now) groups and events are not affected by this policy change. So if your followers have joined your Facebook group, you can still curate content that would be of value to them there. You’re very welcome Mav! Thanks for stopping in today. Unbelievable. Once again, relearning the blogging biz. Never a dull moment. But then again, isn’t that we thrive as bloggers? 🙂 Thanks for posting, Katie. You are the most amazing blog mentor! Blessed to have you! Aw, thanks Jen! Facebook isn’t the only outlet and this policy change only affects pages, so we still have quite a bit of free working space on their platform. Have to be flexible and always looking for better ways to grow, that’s what makes a great entrepreneur. Thank you for such an awesome breakdown. I blog for the fun of it, it was never a money making thing for me. Facebook is becoming way too much now. I know of persons who have tried several times to get blue tick verified and have not been successful. We’ll see how it goes from here. In my region (I live in the Caribbean), we can’t get grey tick verified, and only people with high numbers of page members seem to get the blue tick. I have some other stuff my sleeve so I will focus on that more via my blog and then just link it back to my page. Thanks again!!! The “subniche” category doesn’t have “Blogger” available but I’ve seen other bloggers who have “Blogger” and are verified… How do you get around this? I’m not a company/business so the subniches, I can’t pick just one. Can it be changed later? Sarah, I’m not sure if you can change it later. It’s my understanding that it has to be either a public figure or a company/organization as the primary business description for the page. Not sure how much the sub description plays into it. I have seen some verified with “product/services” and others with “new/media” though I am sure those are not the only options. I don’t have any inside info on what Facebook used to determine whether or not to grant verification. I wonder what this means for IG. I guess that’ll head the same way too in future. We’ll have to be more creative with what we post if we don’t want to be verified Wade. But don’t forget about groups and events, and other social media, of course. I have a couple of pages that I manage that are businesses and they don’t have the Verify This Page option anywhere in the settings. What does that mean? Mary, it seems that in the about section of the page, the page will need to be listed as author, public figure or writer in order to qualify for the blue verification. Thank you for this information. I don’t seem to have a verify page option. Am I looking in the wrong place? Marcie, it seems that in the about section of the page, the page will need to be listed as author, public figure or writer in order to qualify for the blue verification. Then you need to go into general settings for the page and follow the verification instructions. Thank you, does this effect all business types? Or just bloggers? This affects everyone who has a page Marcie. Blogger, business, mother, daughter, artist, doesn’t seem to matter. If you own a page, the policy applies to your page. Does this only apply to blogs? According to Facebook’s policy Maria, this applies to every Facebook Page. If you own a page, the content posted on that Page must comply with the policy. What will this mean for the Direct Sales industry or is this only in regards to “sponsored content”? I expect direct sales and MLM will both fall under “sponsored content” because it is product you do not own. But in our facebook groups and events we are fine to carry on for a while. May need to increase twitter, pinterest, and instagram action. Not necessarily Kathy. I will be address Facebook groups in a post very soon. I’m a little upset though. I will just have to do the workaround you mentioned and hopefully I can find ways to interest my followers enough to make them even want to click the link. That would be a nice boost to my web traffic, so that’s a plus. Hopefully the companies I work with choose to let me use Twitter and other social media sites more. It’s unfortunate that it makes it harder on bloggers, but you have the right idea Ronda, we’ll just have to be more creative and industrious in finding ways to serve our readers and our clients. I’m itterly confused. I don’t think I’m that difficult to confuse though :). I guess I’ll just go about my business and see what happens. FB already stops people who like hour page from actually seeing what’s on your page. When you think you finally figure things out, they change again. Infuriating. I applied for a blue tick and wasn’t accepted as I’m not ‘famous’ by their standards. Yet another case of Facebook turning into a cool kids club and screwing us little guys over. Facebook just edged Twitter out for the most insane decision by a social network recently. I would take this to mean that I can’t reshare content shared by my favorite brands? And I can’t recommend any brand or product to anyone even in a one-on-one discussion – even if they ask me? If I’m understanding this correctly, bloggers can’t share each other’s posts anymore – not even something highly relevant to our audience on our own brand page? My head hurts. I never really liked Facebook anyway. Maybe it is time to only use it to look at pretty pictures. I wonder if it is ok if we share those as long as they are personal property and not shared by a brand? What a nightmare change this is. Here’s another question. Suppose I contribute content to another site. Am I now prohibited from sharing content that I wrote because it is on a site I don’t own? We are really going to have to find some experts to sort this all out for us. There is definitely some terms that Facebook would do well to define better. I too would like to see them address the question of guest posts. I believe those assumptions would be correct for a non-blue verified page, Gail. However this policy does not govern you sharing a friend’s post b/c you like it on your personal profile, in groups, or event pages. This is crazy. Some people are making a living for years from affiliate links on FB, and now they have to take them down? Will the links just stop working? Or will FB shut down the Page? Do they give people any time to make changes? I just started my Page recently, about some products. I have photos of them in the cover. So now I have to change the cover? By when? So confusing. And no photos in the posts either? like shares from the companies that make them? How are they going to announce this or do we just have to stumble on it? Seems FB could have thought this over long ago instead of taking away people’s livelihoods. Some people do not have a blog, just an FB page. It’s always a mistake to put too much on some third-party site. So it sounds sort of like if you make the page about yourself, rather than products, you can get verified. What you are allowed to post as a person page is not clear to me. More brilliance from the 12-year-old geniuses of Sili Valley. I understand the frustration Tori. The policy update in question applies to pages only. Facebook did announce this on their blog, and though they have not stated a definite consequence for non-compliance (that I am aware of). The truth remains that this is their platform that you and I are using for free, and when we opened an account with them, we accepted their terms. If we no longer like how they run their business, we are not required to use the platform. I’m a travel agent and I create my own deals and post on my website. However, these deals are created through suppliers. Any idea how this is going to work? I usually post on FB and then run ads. Would I have to tag the supplier? Many of these deals involve multiple suppliers. That is a definite grey area Krista. I don’t have the answer. I expect that Facebook will need to spell out more clearly it’s policy in regards to situations like yours as well as affiliates, MLM, and those whose work is featured on other’s sites and also want to share that it was featured. Great to see someone else commenting about the potential issues this could bring to bloggers and small business owners. I did raise this with some industry leaders both in Facebook Social Media niche and Blogging Niche and most seemed to not care, or just didn’t understand what the changes really meant so it is great that you are helping to educate people to. Thank you, Sam. Yes, you are correct. Facebook mentioned the change in policy first on April 8th, and the current, latest update to the policy was April 26th. Many are hoping this is not what it appears to be, but I agree that there are potentially huge ramifications for bloggers and small business owners if Facebook indeed intends to enforce this policy. These changes are very confusing. Thank you for spelling them out for us! So many questions left for Facebook to answer though. As a blogger, what happens if we promote someone, say an author for instance, and use Amazon or GoodReads links to do so. Would the author need to be tagged as well as Amazon or GoodReads? Very frustrating with all the gray areas Facebook leaves us facing. Blue verified pages who do branded content posts will only be allowed to tag one merchant/brand in a single post. This is some really weird product placement thing. It’s very odd. For anyone that does direct sales I think you can probably get around it by stating on your page that you are a registered distributor for “xyz” as I think technically then you are promoting your own product as you are the distributor and technically employed by the company to a certain extent. I would like to see more about how this works legally, and it will create issues for bloggers including myself, however there are definitely ways to get around it. I wonder what they would do if you posted pictures of the product and blurred out the company logo (kind of like what they do on TV when placement issues arise, although you don’t see it much now). I also run a business page but thankfully for the most part it doesn’t seem like it will have any effect on my business page as we have our own branded products. I agree, there could be some clarification as far as the specifics of what is allowed as branded content. This makes my head hurt. I hope you don’t mind, but I’ll be providing links to your article on my own blog. Thank you for this information. Off to take some Advil now. Thanks Suzan. Sorry for the headache. I’ve had my second cup of coffee now but I have a feeling it will require several pots of coffee in order to make sense of this. I am an author and wonder if this new policy prohibit our readers from sharing our book links? While I do try to purchase FB ads (don’t get me started on the brown shirt policy regarding book covers), sometimes I simply post snippets for my books along with the buy links. Will I no longer be allowed to do either if I am not ‘verified’? And what about readers who post links to books because they liked the book and want to recommend it? You are allowed to post content you own Suzan, and people are allowed to share your posts via the share button. So it may not be as depressing as it seems. Okay, I am an author as well. I wrote the book but amazon sells it, as does B&N etc. So I can’t promote my book being sold on amazon via my FB page? I’ve applied for the blue check, months ago, applied twice in fact and have never heard back. This is going to be an utter disaster in the Indie Book community. We count on help from bloggers and fellow authors. And as we have been desperately scrambling (for two years!) to find a more viable means of communication with the readers, it’s a sad truth that FB remains our biggest connector. And what a distaster that charge through will be. Most of us are broke 95% of the time and to have a well-meaning, well-established blogger post something about a book they genuinely loved and recommend suddenly cost us $50 will (nearly literally) break the bank for not a few of us. Disaster is in the attitude J. I would encourage you to be creative. There are other ways to promote one another. You can do this. And I just posted my first giveaway that I’ve done in ages!! I’ll go remove it. The majority of what I share on my blog’s fb page are other inspirational posts/articles from other people! Its not even worth my time anymore to keep up with a page!! I’ll just continue to exclusively use my personal page. Thanks for breaking this down. Unfortunately this means I will probably have to shut down my page, as I blog for fun and not business. I have no business documents to verify and I have about 500 likes on my page currently, not anything along the likes of what Facebook wants from their branded and verified pages. I honestly think this is crap, but I guess I will start posting on my personal page from now on since it didn’t say anything about that. Sigh. Facebook strikes again. Luckily there’s still Twitter and Instagram, and I have a much more engaged following on those platforms. Thanks for commenting. Please follow us for further updates as this progresses. This really only applies to sponsored (paid-for) content. Like if a brand pays you to post to your page about their brand. If you want to post about a brand you love or share other people’s content, you can still do that, as long as you’re not being paid to do so (which was against the TOS in the first place). This is a relaxation of those rules and a way for brands to get more paid reach. But for most of us, it will have no impact on our Pages. Business as usual. How will FB decide if it’s curated or an ad? Not everyone is honest about disclosing. I don’t have an answer to that Donna. It would be nice to have that clarified, wouldn’t it? So if someone sends me some rice and asks me to use it in a recipe- for a fee- and I post this recipe on facebook without mentioning the rice or “sponsored”, I am okay with my post? I guess they figured out that bloggers are too poor to pay their exorbitant fees for promoting posts or pages ($20 for 2 page likes that facebook will most likely delete at a later date.). I read that interaction is way down on facebook. I wonder why? I cannot interpret the case by case situations Kathy. I would encourage you to read the TOS that you agreed to when you opened you Facebook account. Read the policies for pages, and then decide how to proceed. Katie- I cannot help but feel your post is inciting some panic that is totally unnecessary. The clarification in FB branded content policy is only an extension of the FTC’s already-imposed online endorsement rules. Those of us who have been blogging in the business world have been aware of this for years. The simple explanation: if you intend to endorse or recommend a third-party product in your blog, you must explain your affiliate relationship. I other words, I cannot write a post about how much I love and recommend Sprout Social without mentioning that I am an affiliate. If I am not and affiliate, I am free to recommend whatever I want yet I still have to disclose my relationship with the product in the blog. The reason it is attached to verified pages is because Facebook wants to force people with these “approved” accounts to let their followers know they have a stake in the product and are not just promoting it out of the goodness of their heart. Here is the link to the FTC guidelines bloggers are supposed to be following: https://www.ftc.gov/tips-advice/business-center/guidance/ftcs-endorsement-guides-what-people-are-asking. I assume that because most bloggers ignore these policies, Facebook is trying to handle this in their own way by enforcing their own version to make sure that verified accounts cannot promote products they have relationships with and pass it off as just something they love. It’s not any deeper than that. We should all be in the habit of disclosing any affiliate relationships we have when promoting other people’s stuff. It’s only fair to our fans so they know that we get a benefit when we recommend something or we truly just want to recommend the product. Chris, my intention is to calm the hysteria. This is not a question of FTC regulations it is a question of knowing and understanding Facebook’s terms of service and use. I agree that Facebook appears to have been lax in the past in enforcing policies, and I also agree than many bloggers and influencer have knowingly and unknowingly perhaps ignored the policy. However, from today, going forward, each user of Facebook makes a decision to abide by the stated rules or ignore them and face whatever consequences come. Those who’ve been sharing branded content (not their own) on profiles, pages, events and groups) up until now have been in violation of Facebook’s stated TOS. The now enforced policy is not as difficult to abide by as some are making it out to be. Several bloggers within my network have spoken with Facebook directly and found information quite contradictory to what you are sharing. The blue badge (at this time) is for major public figures, celebrities, musicians, authors, and personalities. In fact I applied for for a blue badge and was told the same. Facebook told us that for now, we can continue sharing our content, affiliate links (with proper disclosure), and sponsored content without issue because the verification badges don’t currently apply to most of us. Unless you are a major influencer (think Scary Mommy, Ryan Reynolds, Lady Gaga) the verification doesn’t currently apply to you or the rest of us. Take this as you will but this came from several sources yesterday as Facebook was a sponsor of Mom 2.0 and many bloggers bombarded them with questions yesterday. I appreciate you sharing that Rachele. I am aware of several of those comments floating around. What I am sharing is coming from Facebook legal written and published policy. I cannot trust my business to the words of a Facebook representative when they contradict Facebook’s legal written and published policy I am also not a lawyer and don’t pretend to be. In the end you will have to decide for yourself how you will proceed for the good of your business. I use twitter for my blog so I don’t think I have a problem with all that (very muddy tho) however, on my personal page, if I see a good airfare, or some event that my friends might like, I often post it as a CSA but does the policy mean I can’t?? That seems mad…. To be safe Lydia, I would say use the share button to share the airfare specials with friends on your personal profile. So, I am a small blogger reviewing books and doing the occasional giveaway. Sometimes I write history posts, or show my own paintings. I don’t do the giveaways on FB. I don’t do pure promotional posts or cover reveals. I have a FB page personally and also for my blog. I have read your article and the “official” one and I don’t get how it applies to me. Should I just remove my blog FB page? Hi Steph, as long as your account is in compliance with Facebook’s TOS and your page is in compliance with their additional page policies you have nothing to worry about. There are links provided to both in the article above if you need to reference them. Thanks for stating it so clearly. You may want to read article too. Wait, what now? The content as described sounds like it means nobody’s permitted to share any content at all. If we see a funny meme, or a picture of a cat, or an article we think is interesting, or a YouTube video we like, we’re not allowed to post it to our personal pages because we don’t own it? That can’t be right, but that’s what it sounds like. How does that even work? What else would there even be to post ON Facebook if that’s what they mean? So this means if I share a product or service I like or think is cool from my profile and it comes from a page The page will get penalize and charged an advertising fee from Facebook, correct? Where does the issue of freebooting video for profit come into this. Is it alright if Facebook is making money from illegal and stolen content and property? Sounds like the government is running this thing. Brad, Facebook has not stated they will be charging, but they’ve made it clear in the TOS and with this new update that if you are promoting content you don’t own, they prefer be through a paid ad or as a verified page using the branded content tool. So what Facebook is forgetting is that *I* amassed my following of over half a million likes on my page. They come to FB to read MY page. So, if I promote a company’s product, FB gets paid but I don’t? How is that fair? I understand we don’t pay to use FB, but FB exists because of popular pages like mine. If there were no pages, FB use would go WAY WAY WAY down…as would their earnings, etc. They have been putting sidebar ads on my page for years – when do I start getting paid for all the eyeballs I draw to my page? Great comments Lisa. That would be nice wouldn’t it, to get paid for the ads they put on our pages.